There are practically an endless number of reasons to fall in love with Nova Scotia, one of Canada’s breathtaking Atlantic Provinces. It offers fabulously fresh, delicious seafood, friendly locals, abundant wildlife, picturesque lighthouses, beautiful beaches, and some of the most scenic coastal trails you may ever hike. This is a true hiker’s paradise with everything from short treks to day-long or more hikes. Whatever you’re looking for, you’re sure to find it among Nova Scotia’s top trails. 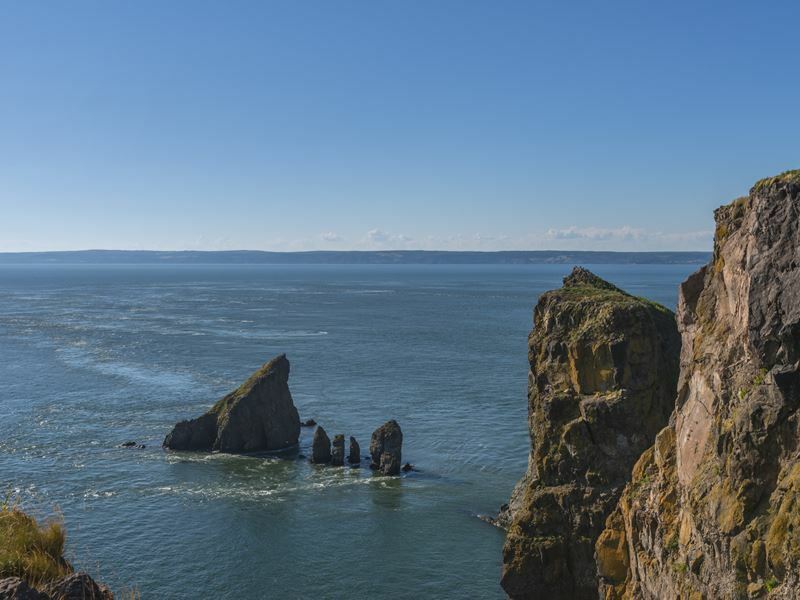 The Cape Split Trail is one of Nova Scotia’s top day hikes, located in the 447-hectare Cape Split Provincial Park Reserve. 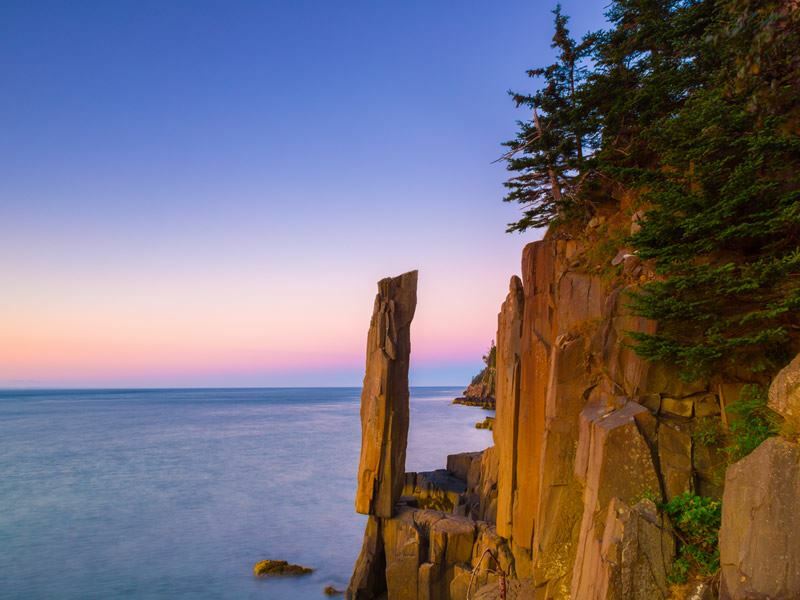 While it’s nearly 8 miles round trip, this coastal trek can be accomplished within four to five hours and you’ll be rewarded with unsurpassed views of the Bay of Fundy, famous for having some of the world’s highest tides, with approximately 100 billion tons of water rising and falling here twice each day. The trail begins at sea level, where you’ll hike through a lush canopy of trees before ending some 200 feet above the water, with sheer cliffs on either side, along with a host of nesting birds to watch. In addition to hiking, the park itself offers impressive wildlife viewing opportunities and picnic spots. 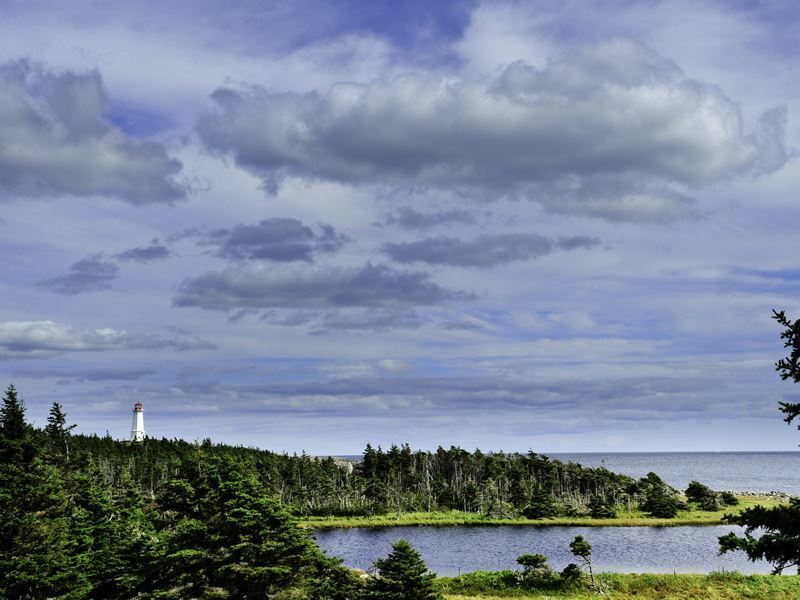 If you’re a fan of lighthouses, be sure to take this trail on Cape Breton Island that runs for slightly over three miles along the coast, with interpretive panels describing the area’s nature, geology and historical significance throughout the route. The first 1.2 miles will lead you around the looped trail, and beyond that, the rest is a rugged trail following the coastline through spruce woods, and alongside steep cliff edges, passing through a number of pretty coves. This is the spot where Canada’s very first lighthouse was constructed in 1734. During the 1758 British siege, it sustained significant damage, and was left in disrepair until being replaced in 1824 by the current Louisbourg Lighthouse, built in 1924 right next to the original foundation. The remnants of the first lighthouse can still be seen today. 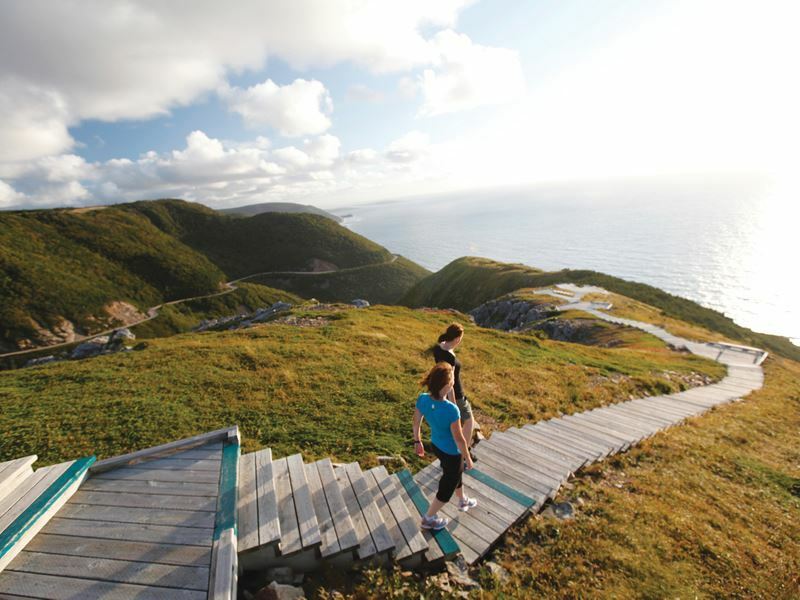 The Skyline Trail in Cape Breton, located between Pleasant Bay and Cheticamp, offers a glimpse of the island’s famous Cabot Trail, a 185-mile highway that features more than 25 coastal trails. From this trek, you can watch for a variety of wildlife, including moose, bears, bald eagles on land, all sorts of birds in the sky, and whales in the Gulf of St. Lawrence. You’ll enjoy a host of jaw-dropping views of the ocean and a dramatic headland cliff too. 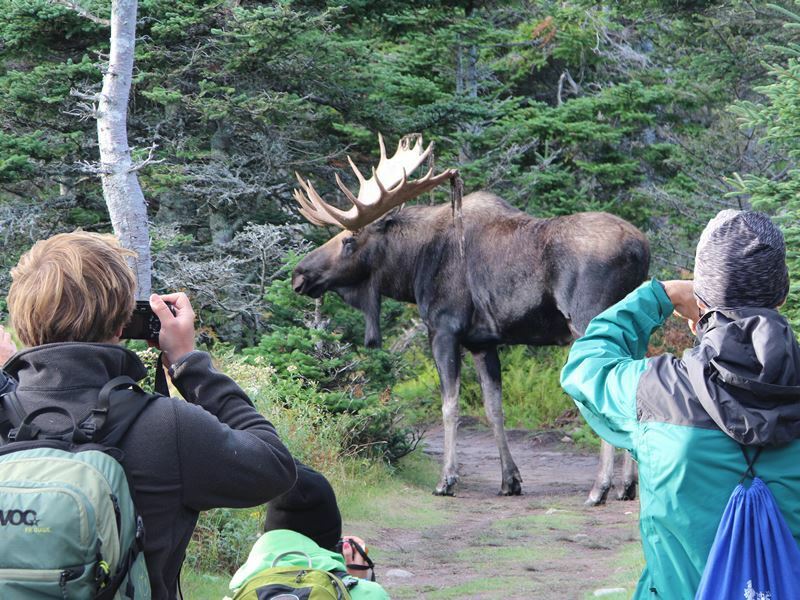 It’s an easy 4-mile loop hike, over well-maintained trails that meander through forest and shrub land, and includes walking through a fenced-in stretch of shrubbery, to keep it protected from the moose in the area – be sure to give these massive animals a wide berth. This hike is a great one if you want to watch a glorious sunset, just be sure to bring a flashlight for the return journey. While there may be a few others watching with you, if you want to enjoy it alone, just walk further down the boardwalk trail to the dirt trail, which leads out to the far end of the trailhead. 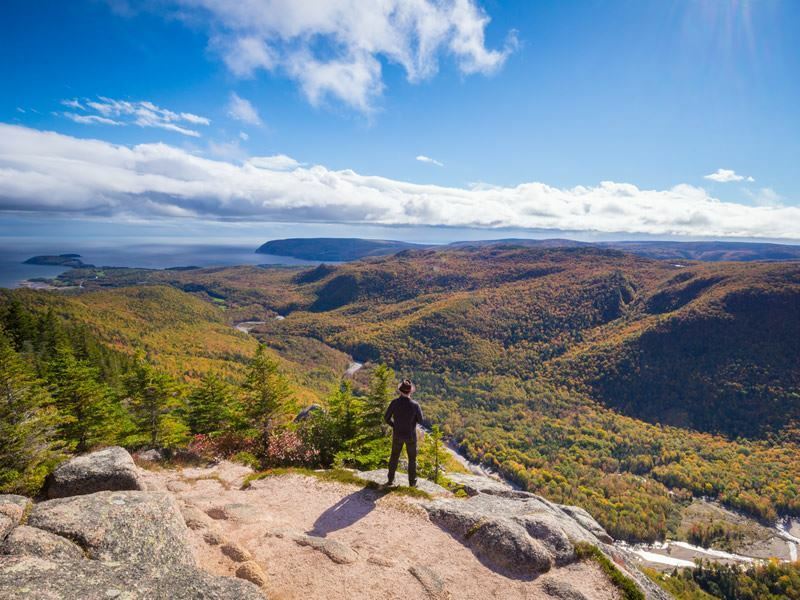 The Franey Trail is another one of Cape Breton’s great hikes. While the trail is steep and rugged, you’ll get to enjoy panoramic views of Clyburn Brook Canyon, and, on a clear day you can see the Atlantic coastline, all the way from Cape Smokey to Ingonish in one direction and the soaring mountains, including Franey Mountain, in the other. This is a 4.6-mile loop trail that typically takes two to three hours to complete, though it is considered difficult due to the steep climb and rugged sections. It’s also a good trail for wildlife watching, including moose. Herring Cove Provincial Park Reserve offers a fantastic short and scenic walk just 10 minutes from Halifax. It boasts a rugged landscape that’s quintessential Nova Scotia, while providing the perfect spot to get away from the city, enjoy the sounds of the sea and the rays of the sun on a summer day. You can choose any path along the rocks you’d like, clambering over large granite rocks that drop off into the sea, or follow the easier path above. The trail starts off through trees and brush, but mostly follows along the rocky coastline. From the parking lot to the high point, which affords awe-inspiring views, it’s just under a mile, so it can easily be completed in just 45 minutes. Hike in the late afternoon and you can catch a sunset while watching the ships pass through into the harbour. Kejimkujik National Park Seaside is an isolated and wild 13.7-mile stretch of coastline in the province’s South Shore region. It hosts two outstanding trails, the Harbour Rock Trail, a 3.2-mile round trip trek, and the Port Joli Head Trail, which is 5.4 miles round trip. Both offer telescopes, benches and interpretation exhibits, while bringing views of secluded rocky coves, sweeping sands, crashing ocean waves and glacier-carved headlands. You’ll often see shorebirds and seals just offshore too. This seven-and-a-half-mile-long mostly flat, gentle trail is situated in the southeast region of Cape Breton Island. If you’re looking to get away from other humans, this one is an ideal choice as you probably won’t see another soul once you leave the village of Gabarus. It leads to the ruins of the old abandoned fishing village known as Gull Cove, with the trail winding alongside the sea, through fields and wooded areas. Taylor Head Provincial Park occupies a rugged, wind-swept peninsula which juts some four miles out into the Atlantic, located in the province’s Eastern Shore region. 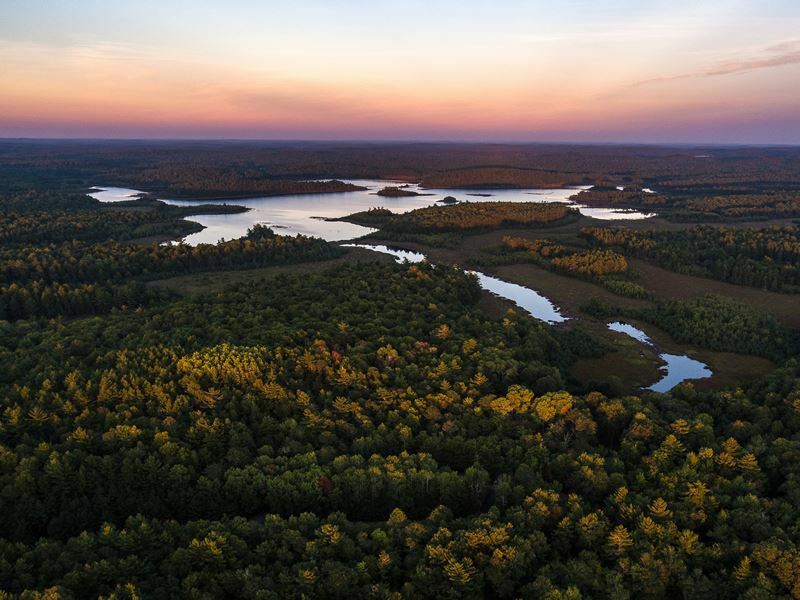 The park’s 8.8 miles of trails provide access to a range of natural habitat, wildlife, fascinating geological features and even secluded beaches. There are four separate trails in the Taylor Head system, including the Headland Trail, a 5-mile double loop trail which also includes the 2.5-mile Spry Bay trail. 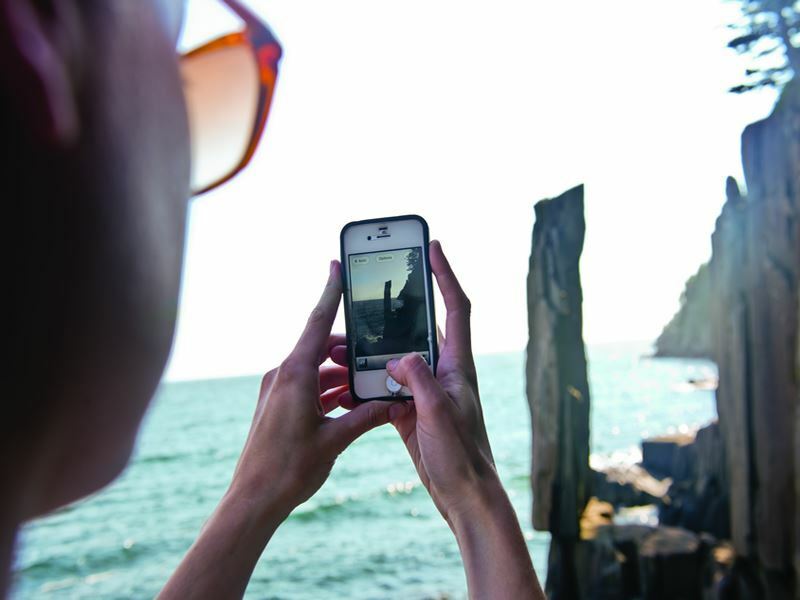 You can easily accomplish the entire trek within five hours, accounting for all the times you’ll just have to stop to capture photos, and simply enjoy the sights and sounds of the sea. Around practically every corner, you’ll discover yet another new cove, or pebble beach, and the view from Taylor Head itself is absolutely breathtaking, renowned as one of Nova Scotia’s most impressive coastal views. The Balancing Rock Trail is located in Tiverton, in the Bay of Fundy & Annapolis Valley region. Hiking the well-groomed 1.5-mile trail and a 235-step staircase will bring you to a platform with a magnificent view of St. Mary’s Bay and, of course, the famous balancing rock. It also features picnic tables and interpretive panels that explain more about it. Sometimes referred to as “Nature’s Time Post,” this narrow vertical column of basalt is the most photographed of its type in this region. A force of nature, it stands proudly on the cliffs overlooking the bay, and many come because they have to see it in person – it’s hard to believe those images are real. The nearly 30-foot rock looks as if it will topple over any second, hanging on for dear life, though it’s likely to have been here for thousands of years. At Cape Chignecto Provincial Park, you’ll see monstrous 600-foot-high sea cliffs rising from the Bay of Fundy, known, as mentioned, for the highest tides in the world, lapping against them. The wilderness park boasts nearly 20 miles of pristine shoreline, protected coves, rare flora, and remnants of old-growth forest. 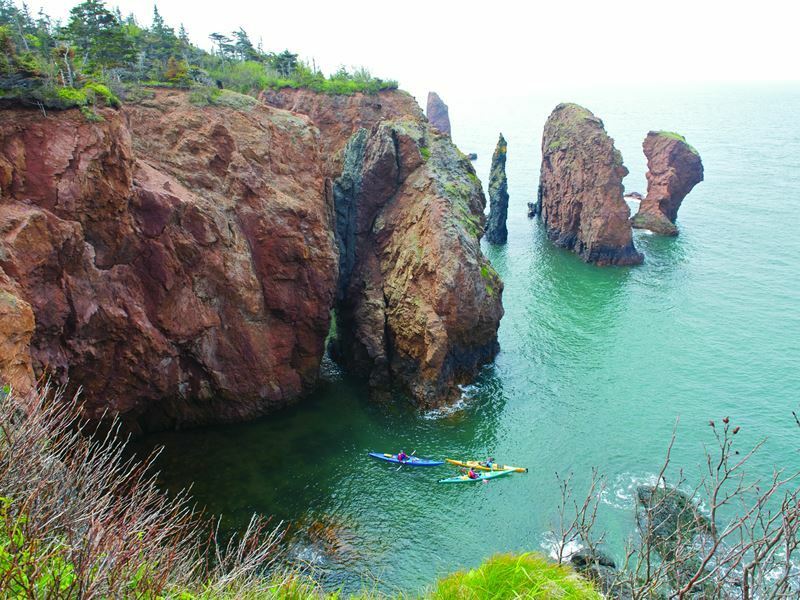 It’s also home to one of the world’s best hikes: Cape Chignecto Coastal Trail. While the entire 33-mile loop trail takes three to four days to complete, including time for exploring the beaches and viewpoints along the way, you can hike just a portion of it and enjoy many of the highlights. The trail between Refugee Cove to Big Bald Rock is a 5.6 miles, and will take you alongside some of the province’s steepest cliffs. The demanding, rugged nearly 5-mile trek from Big Bald Rock to Seal Cove, offers jaw-dropping views along the coast of sea stacks, and the popular Seal Cove to Eatonville trek is a 3.7-mile route that’s moderately challenging while offering the chance to explore the area’s history as well as its fantastic scenery.